The square root of a positive number ‘n’ is that number which, when multiplied by itself, gives ‘n’. 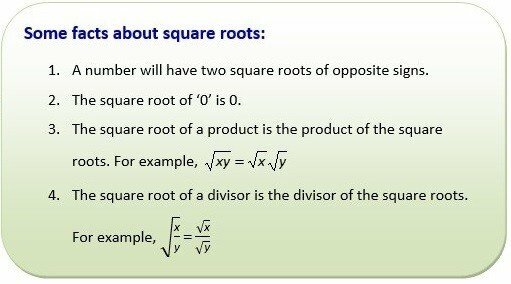 There are two square roots for a positive number. For example, the square roots of 25 are +5 and -5. The positive square root of a number is called the principal square root. Example: Find the square root of 81. The cube root of a positive number ‘N’ is that number which, when multiplied by itself twice, gives ‘N’. The symbol for cube root is a radical sign with a small 3 on the left ∛ . Example: Find the cube root of -125. Find the square root of 169. What is the cube root of 1331? What is the square root of 1,024?